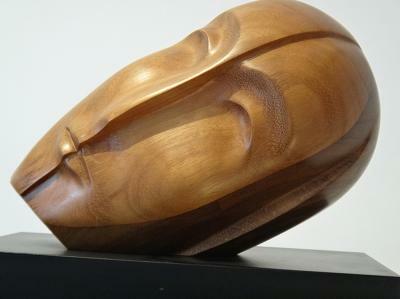 Naim Doumit, Lebanon’s leading sculptor was born in Mount Lebanon in 1941. He studied painting and sculpture at the Lebanese Academy for Fine Arts and obtained a diploma in Wood sculpture in 1965 from the Scuola Arti Ornamentali in Rome, Italy.Widely known for his abstract work and fluid style, he has exhibited his artworks at solo and collective exhibitions in Lebanon, Iraq, Jordan, Algeria, Greece, France, Italy, Germany, and USA among other countries. Doumit has also been the professor of sculpture in the National Institute of Fine Arts in Lebanon since 1966, in addition to being the artist behind several monuments all around his native country. In the words of Joseph Abou Rizk: "If the sculptor Naim Doumit goes far into his explorations, it is only because he does not content himself with fathoming all what is new in the depth of his being. This is because he realizes that the human conditions which he incarnates in his sculptures, could, alone, bring about aesthetic bliss.” Timeless and unprecedented, Doumit’s sculptures are achievements, creating a world of idealistic perfection. Whether using marble, wood or stone, the artist transforms rigid material into warm expressions wrapped in a veil of mystery, their beauty lying in their simplicity.